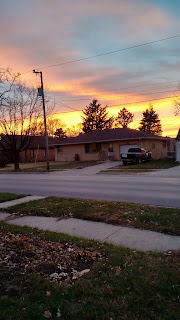 The last week of November has been warm, very warm on some days. Average highs by the end of the month should be in the upper 30's and low 40's, but temperatures have been in the upper 40's and low 50's. Thursday was no exception as the high reached 52 degrees in Rockford. 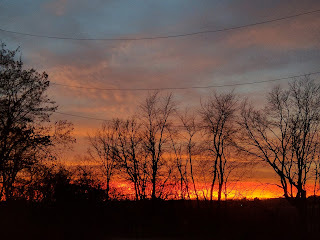 Friday, December 1st, is the beginning of Meteorological Winter! Astronomical Winter begins December 21st. 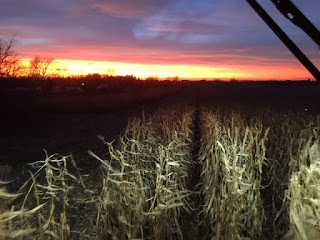 Looking at the winter months from a climate standpoint, the three month period of December, January and February are typically the coldest months out of the year. In order to keep better track of records and averages, Meteorologists and Climatologists use three month periods beginning on the first of the month to identify the seasons of Summer, Fall, Winter and Spring. The average high on December 1st should be 39 degrees, but the forecast is calling for a high near 50 degrees! 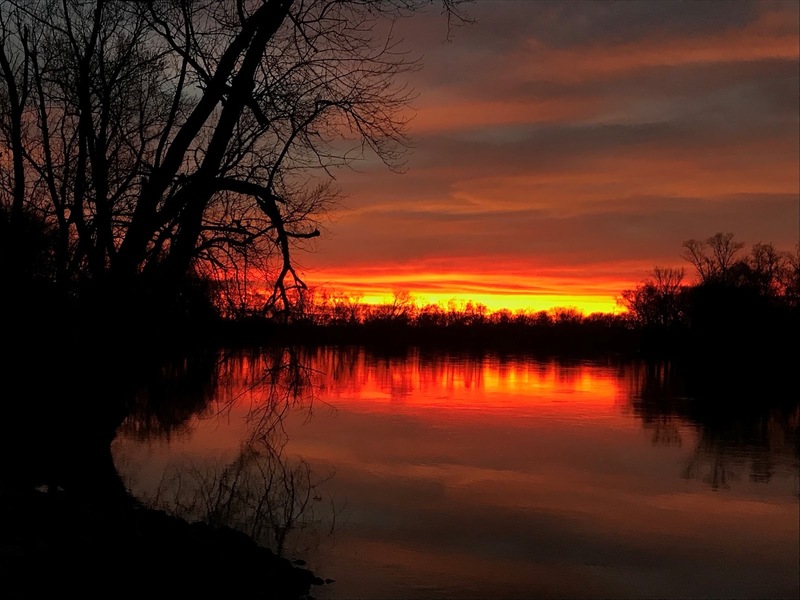 Including Thursday, there have been nine days during the month of November where the high temperature reached 50 degrees or higher. Not that uncommon because our average high at the beginning of the month should be in the mid 50's, and it doesn't fall below 50 degrees until the 13th. What's interesting about those nine days is that most of them were reached just within this past week, typically when temperatures should be dropping back into the 30's. Temperatures will remain in the 50's through the weekend and early next week, with a chance for rain arriving on Monday. 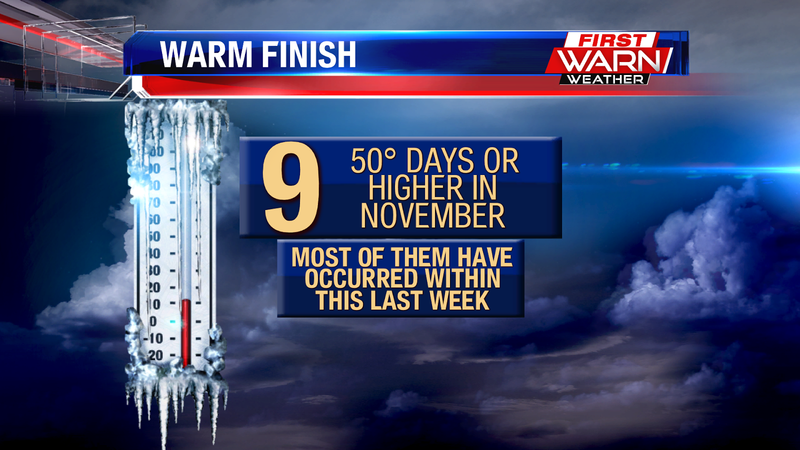 As Meteorologist Kristin Cwynar discussed in the previous post, temperatures for the month of November have almost been a tale of two seasons. 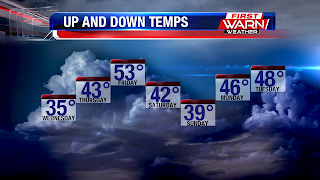 Cold for the first two weeks of the month, followed by warmth for the end. 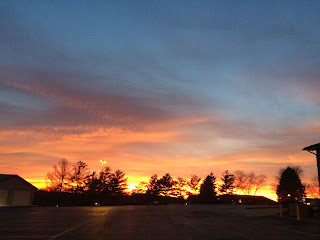 Thursday marks the end of Meteorological Fall, with Friday (December 1st) the beginning of Meteorological Winter. 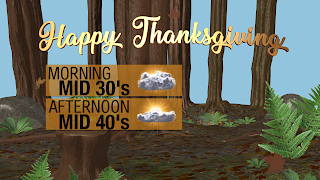 Temperatures for the start of December will be mild, in the upper 40's and low 50's. That warmth will carry over into Monday of next week, but it will come with rain showers (and perhaps a thunderstorm or two) during the afternoon. The rain is a result of a cold front that is forecast to move through late Monday night/early Tuesday morning. This front, though, will be different than the cold fronts that have come through these past few days. This front will be originating from the Arctic and will pull down quite a bit of Arctic air with it. Temperatures are expected to go from the 50's on Monday, down into the upper 30's for Tuesday and then possibly not out of the 20's by next Wednesday and Thursday! That's quite an abrupt change in just one week! And it looks like the cold may last through the middle of the month. Also, with the arrival of the cold it could mean a better opportunity for snow showers over the next couple of weeks. 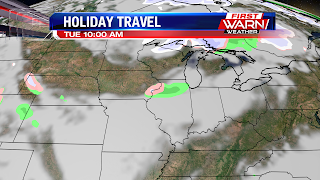 But any exact timing of individual storm systems that could bring snow is yet to be seen. In the meantime, enjoy the 'warmth' while we have it because our warm fall days will soon be numbered. It's been a roller coaster ride this month with up and down temperatures that have been fairly persistent. 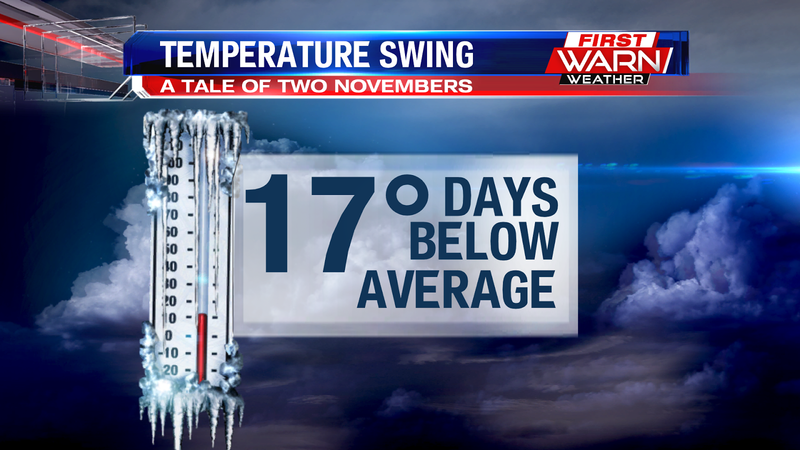 The first two weeks of November were below average, and so far 17 days this month have been below average. But recently, you've notice a different pattern with temperatures trending above average over the past week. 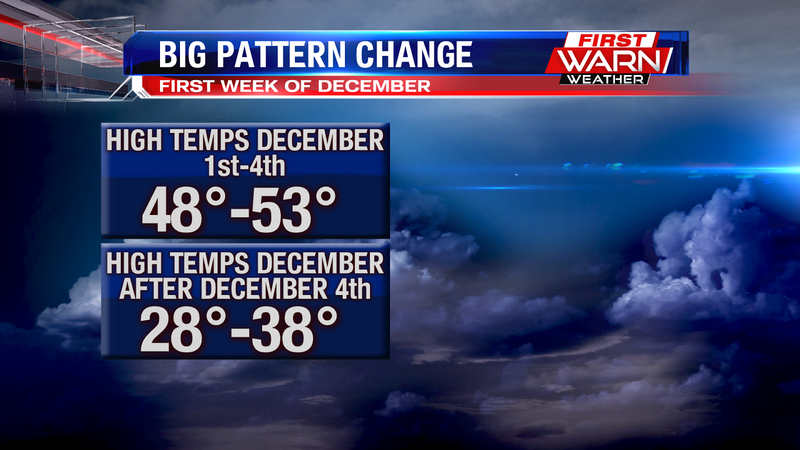 And this trend is going to continue through the first week of December. 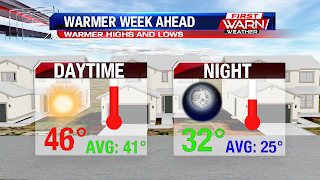 Through Sunday, expect temperatures to warm between 7° to 12° above the average. Typically at this time of year average highs are in the upper 30s to near 40°, but highs Saturday and Sunday climb to 50°. A great start to the work week making it into the mid to upper 50's across the Stateline, only a couple locations hitting the low 60's. The good news is that temperatures will be fairly warm this evening in the upper 40's to low 50's, and only cool down to the mid 40's during the overnight. The bad news is that we've got some chances for rain coming up, so we'll have to take a break from the sun. As we go through the night we'll only see a few clouds here and there, but mostly will be clear. By early tomorrow morning we'll start to see some clouds work back into our area ahead of a cold front, which will bring us some drizzle around 9am, and then chances for light rain during the afternoon. Even though it'll be cloudy and gray tomorrow, temperatures will still be fairly warm in the mid 50's. Once we get into the evening, the rain will move out and then clouds will start clearing out not too long afterwards. 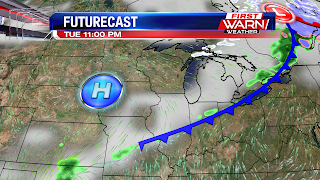 Once we get into Tuesday night, a high pressure system will move in behind the front and begin channeling cold air back into our area, bringing us into the upper 20's during overnight. 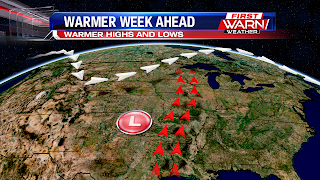 However, that cold air won't be lasting long as that same high pressure system will track eastward on Wednesday, and will begin to shift our winds from northerly to southerly. This is one of the few factors that'll help keep our temperatures fairly warm going through the week. 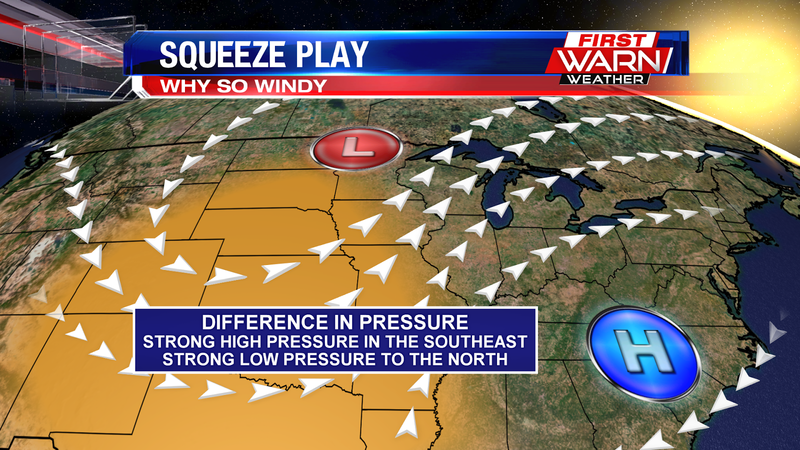 The other factor in play is a cutoff system that'll form Tuesday night in the southern plains. What this will do is form a low pressure system in the plains and help keep that channel of warm air flowing into our area. And with that high pressure system in place, we'll continue to see sunshine for most of the week as well!! 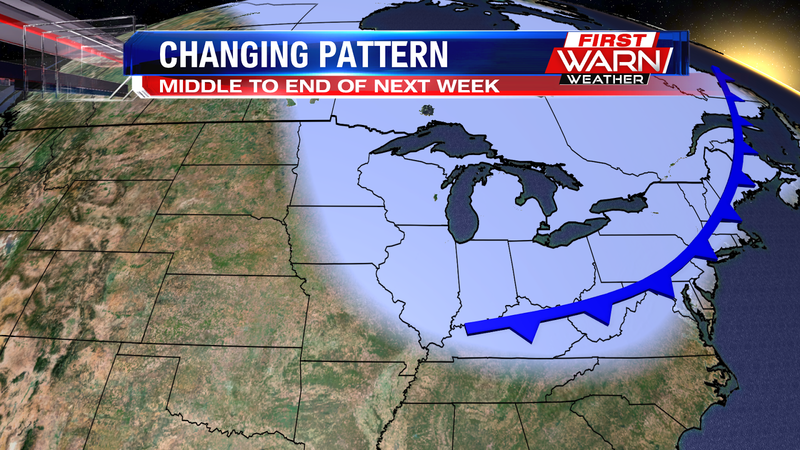 This pattern will bring us sunshine, and temperatures above average for both day and night going through the work week. 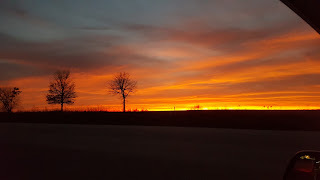 Last Friday we mentioned how close we were to record breaking warmth, and while technically we didn't break a record, we did tie it with a high of 65°. And we're close to doing it again today! 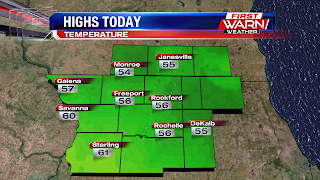 Highs today forecast at 60°, though some low 60's are possible. 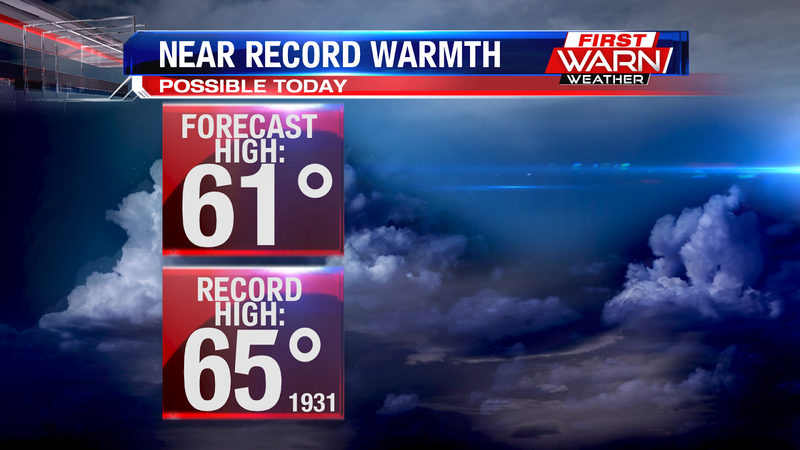 Our record high for today is 65° which was set in 1990. 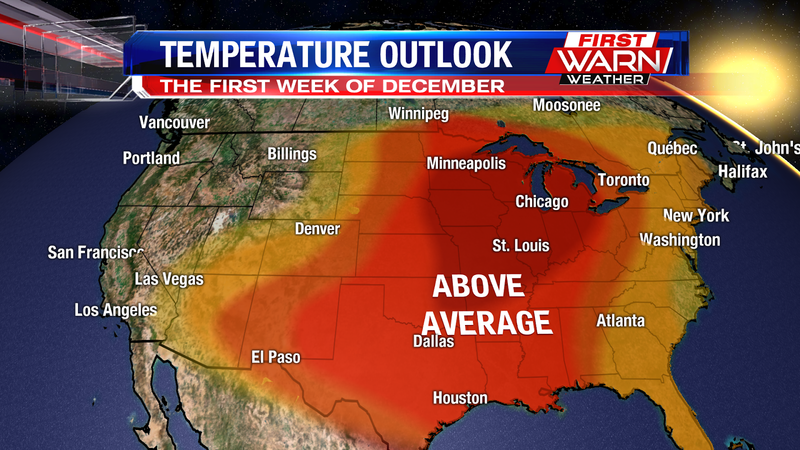 While today will be the warmest in the forecast this week, the rest of this week actually remains above average. 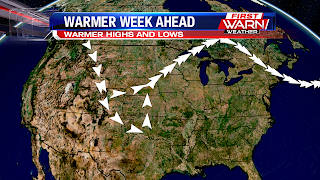 Two different cold fronts will pass this week will bring 'cooler' temperatures but surface winds behind the front turn to the west and we tap into a mild pacific air mass. This is why we won't notice a drastic drop in temperatures. We have 50's in the forecast for Tuesday, and mid 40's through the rest of the week. Are you a fan on the mild weather? Well then I've got good news for you! 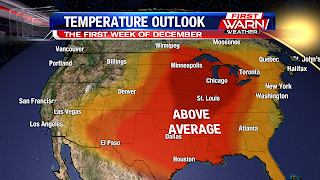 The Climate Prediction Center has outlined the Stateline area, along with most of the U.S to have above average temperatures through the first week of December. The only part of the country with below average temperatures will be found in the Pacific Northwest, while the rest of the country has some elevated probability for above average temperatures. The Great Lakes, Midwest, and Stateline area are under the 'core' of the warmth, with 70-80% probability for above average temperatures. The reason for the warmth is due to the pattern of the upper level winds, an amplified upper level ridge allows the warmth to build to the south, and traps the cold air to the north. 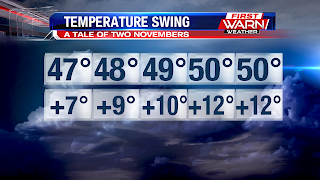 Late Season Warmth Again Approaches the Stateline! Another beautiful day in the Stateline today with temperatures in the low 50's and abundant sunshine that made it feel more like October than the end of November. The mild conditions are a result of a "Zonal" or East to West flow of weather that tends to bring mild conditions to our area. Because of the warm temperatures to our west and Southwesterly winds, the warmth will continue into the start of our workweek! Monday will be another very mild day with almost unlimited sunshine and highs that will get close to 60 degrees! How long will this last? It looks like Tuesday will again be in the 50's, but after that high temperatures for the balance of the week will stay in the 40's. Our normal high tomorrow is 41 degrees and by the end of the month we shouldn't make it above the 30's. 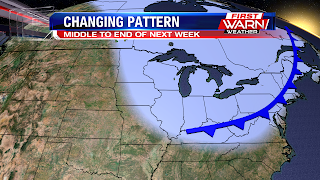 It looks like this mild pattern may stay in place for another week or so until cooler air starts to move in. Enjoy the start to your work week with some sunshine! 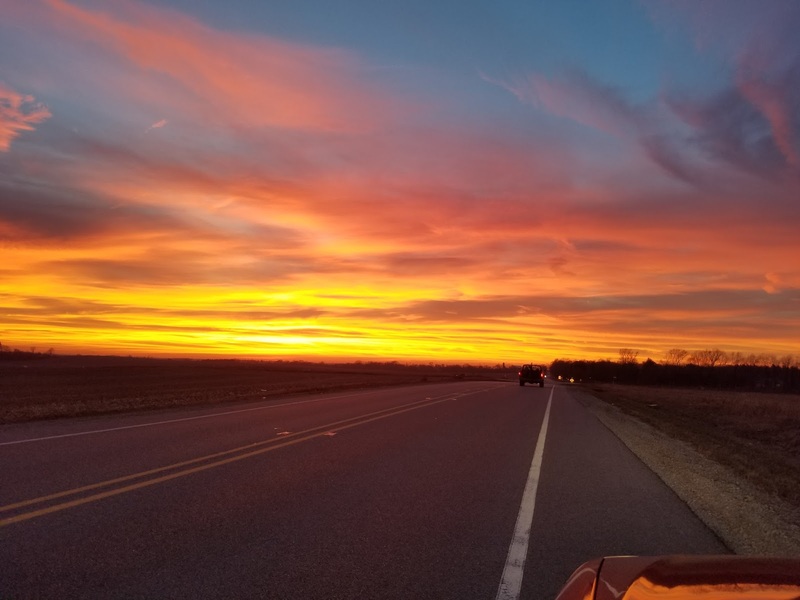 We had a gorgeous start to the weekend as we made it into the upper 40's to low 50's across the Stateline today, with a few locations getting near the mid 50's. 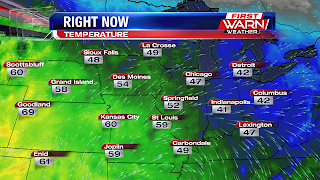 We keep those clear skies during the night, but sadly this will cool us down quickly as we go through the evening. We'll hit freezing around 9pm, before dropping to the low 20's during the overnight tonight. Don't worry too much about the cold though, because we're looking to have another warm and beautiful day tomorrow as we'll climb to the low 50's again Sunday afternoon. In fact, our weather is looking to stay sunny and warm for the next few days!! 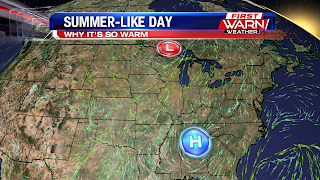 This high pressure system is the reason behind the beautiful weather we've been seeing this weekend. It's kept our skies nice and clear, bringing in the sunshine we've wanted for quite some time. 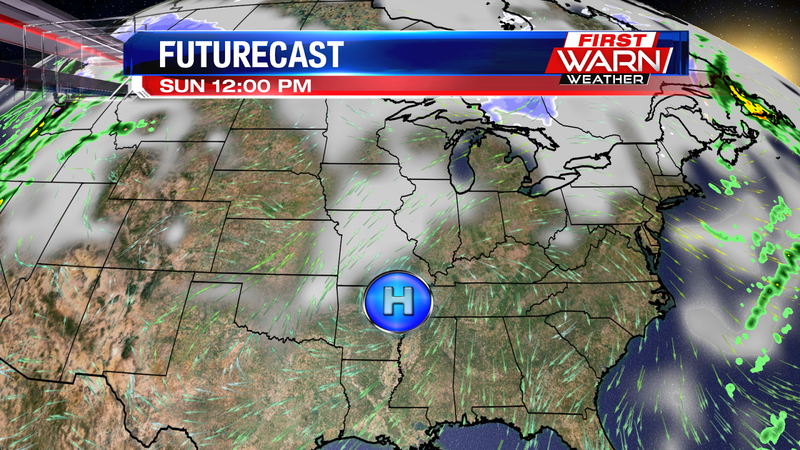 As we head into Sunday, this high will be tracking south of us, which will allow it to pull in more warm into our area. We hit the low 50's today even with colder air coming in out of the north, so once this high begins pulling in warmer air on Sunday, our temperatures will take a small jump. We're looking to hit the upper 50's Monday afternoon and the sunshine will stay with us. However, once we get to Tuesday the sunny streak will end as a cold front will move in to bring us some rain during the day. Luckily, the sunshine returns on Wednesday before another rain chance kicks in during the night and into Thursday morning. Afterwards, the sunshine is looking to stick around and bring us back into the low 50's by next weekend. You can't ask for better weather to end Thanksgiving week. 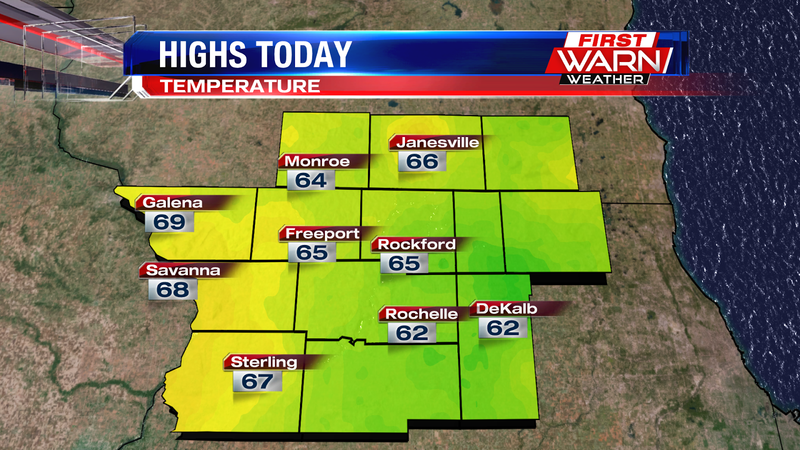 We had lots of sunshine and hit the mid to upper 60's this afternoon! 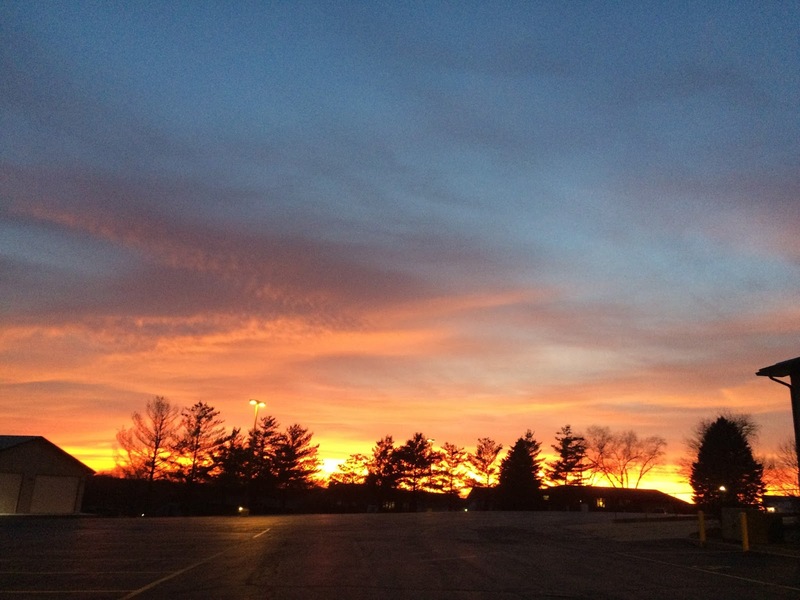 An unseasonably, yet beautiful Friday with temperatures that were 20 degrees above average. 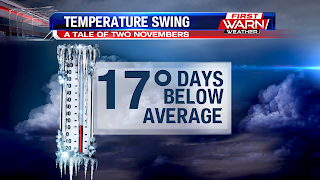 The past few weeks we've been temperatures that were 20 degrees below average, but we finally got the 180. The reason this happened was because of the placement of a high pressure system and low pressure system. The low was positioned north of us, while the high was positioned south of us. This allowed for a channeling of warm, dry air into our area, which is how we got into the mid 60's. The fact that it was dry air allowed for less cloud cover, which helped us warm up even more. We stay fairly warm this evening in the 50's, with chances for drizzle kicking in around 9pm. However, those chances will only be confined to the state line itself. The longest the drizzle would last would be until midnight, but more than likely will end a little after 11pm. 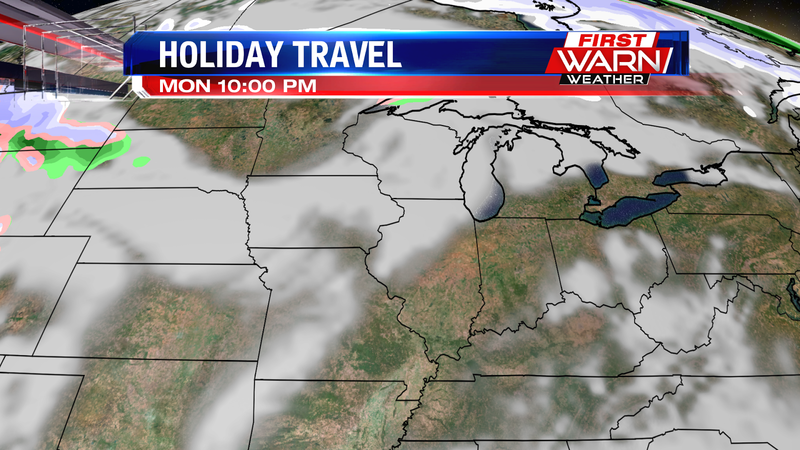 Once we get towards midnight, any remaining cloud cover will clear out. This, along with our winds shifting out of the northwest, will cool us down quickly for the rest of the overnight, bringing us back down into the mid 30's. However, it'll also be a little breezy during the overnight, so wind chills will be in the mid 20's. We're looking to get a gorgeous start to the weekend as we'll get another sunny day, although temperatures will only hit the upper 40's. 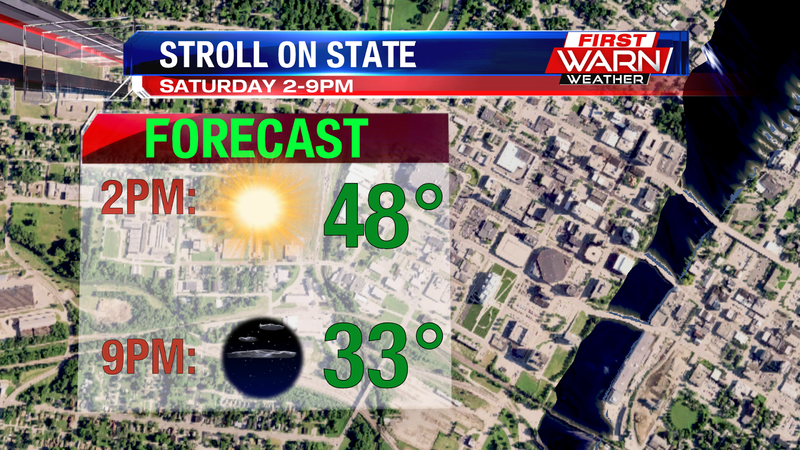 If you're heading out to Stroll on State we'll be sunny with temperatures around 48° by 2pm, but if you plan on going during the evening you'll want to bundle up because temperatures will drop quickly after sundown, hitting around 33° by 9pm. Along with a beautiful start we also get a gorgeous end to the weekend with highs around 50° and more sunshine for your Sunday. Along with that, we've got another warmup on the way! Once we get to Sunday evening, our winds will begin to shift out of the southwest again. This time it's being due solely to a high pressure system that'll track south of us. Our next chances for rain arrive on Tuesday and then again during the late night hours of Wednesday, but then the sunshine returns to end the work week. After Monday, temperatures will remain in the 40's for the rest of the week. 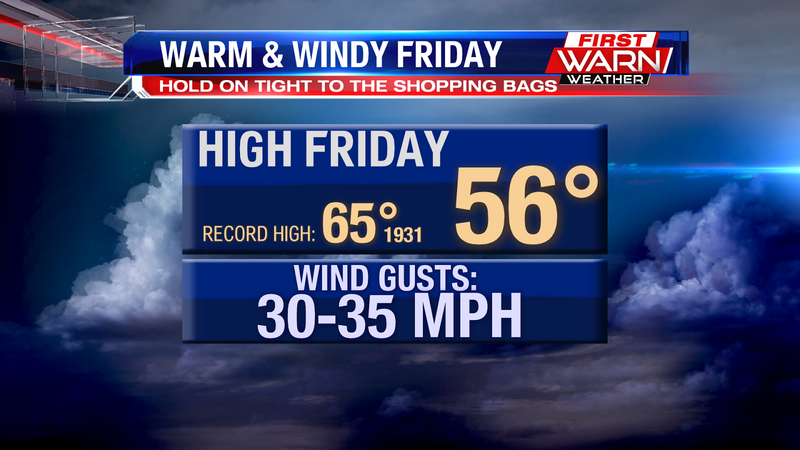 It will be a warm and windy Friday for all of those Black Friday shoppers! It's already breezy this morning, and it will be a windy afternoon. We will have sustained southerly winds at 10-20 mph and those winds will gust as high as 30 mph as early as the late morning. Wind gusts will die down a bit by dinner time, but those winds along with a lot of sunshine will make for a warm afternoon! 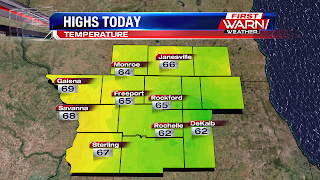 High temperatures today are forecast to climb into the low 60's! That's almost 20° above average and a few degrees shy of our record high. 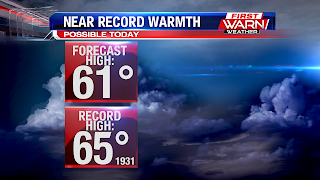 The record for today is 65° set back in 1931, our forecast high today is 61°. I hope everyone had a wonderful Thanksgiving holiday. The afternoon was very comfortable and filled with lots of sunshine. 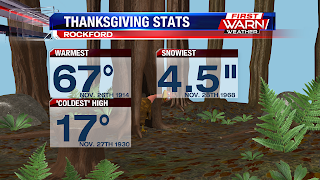 Highs Thursday reached 47 degrees in Rockford, just a handful of degrees above average! The overall weather pattern heading into the weekend and early next week is expected to remain fairly quiet. A strong low pressure system developing Thursday evening near the Canadian/US border will quickly race east, through the Plains and Upper Midwest by Friday evening. 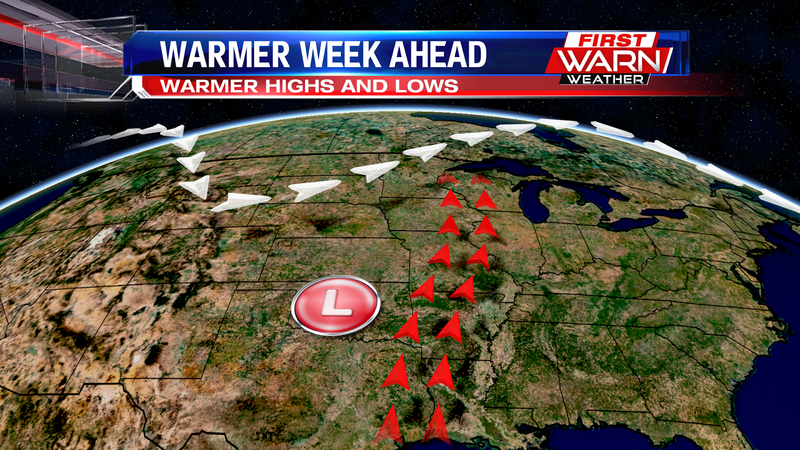 Ahead of the low a very warm air mass will be drawn northward for Friday, pushing temperatures up near 60 degrees! 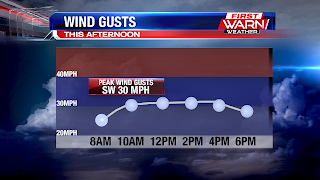 Winds will also remain gusty from the southwest with peak wind gusts to 35 mph. Winds within the jet stream will be moving mostly from west to east through early next week. 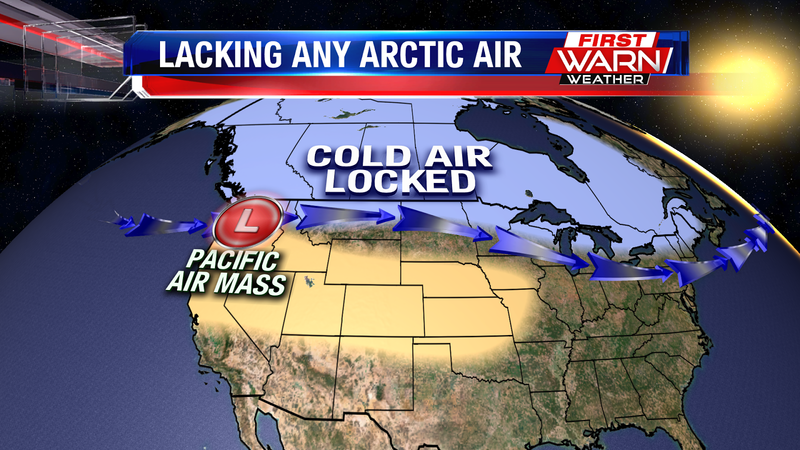 This will help block any Arctic air from making much progress southward. 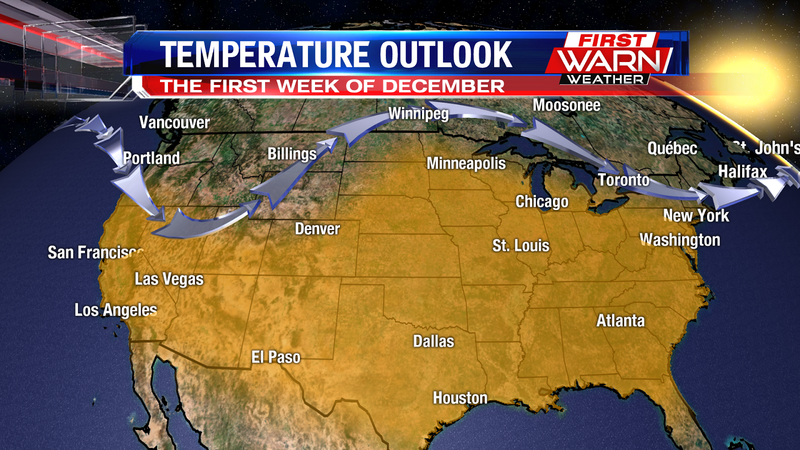 We will get cold fronts to pass through, but the air following those fronts will not be from the Arctic. Temperatures will drop, but considering the time of year those numbers following the cold fronts could be a lot colder. 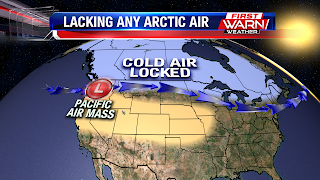 With the jet stream pattern more from west to east, any moisture from the Gulf of Mexico will be blocked as well. This means incoming storm systems will have limited moisture associated with them. 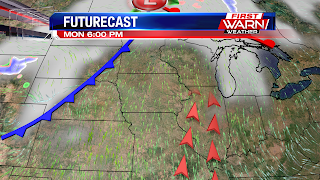 There is a cold front that will pass through Wisconsin and Illinois Friday evening, and this will most likely bring a few rain showers with it during that time. But any heavy or prolonged period of rain is not expected for the next several days. The image on the left is the 5 day rainfall total for the entire country. Notice how the majority of rain is forecast to fall over the Northwest, southern Canada and over the far Southeast. By the middle of next week there does look to be a better chance for rain with a cut-off low pressure system. Right now it looks like that may pass either late Wednesday night or sometime on Thursday. It will actually be a fairly average Thanksgiving day holiday for the Stateline area. 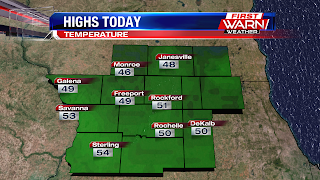 The high temperature for this afternoon is 43° while the forecast high is set for 45°. But most Thanksgivings on average are spent in the 30's. Since records have been kept over the last 110 years, forty one of those have been spent in the 30's and thirty six years have been in the 40's. The warmest Thanksgiving we've had? That would be November 26th, 1914 when the high was 67°; but the 'coldest' high is 17° on November 27th, 1930. There's even been a fair amount of snow thats fallen on Thanksgiving, even though the majority are dry. 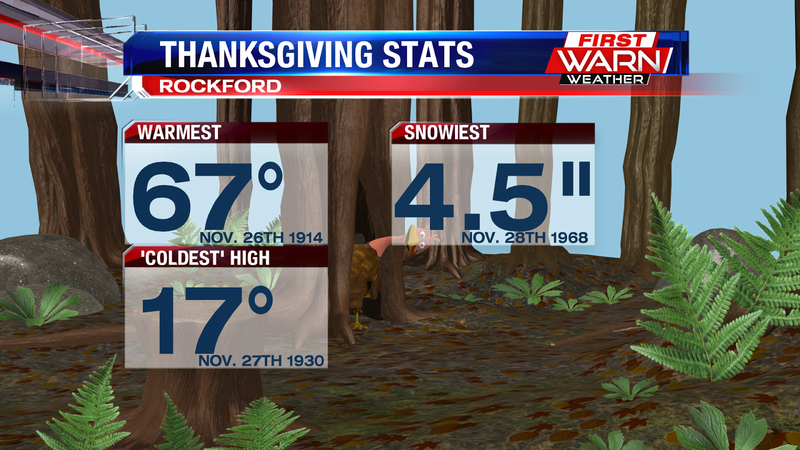 Back in 1968, 4.5" of snow fell in the Rockford area on Thanksgiving. This year expect highs in the mid 40's under mostly sunny skies and light southwest winds. 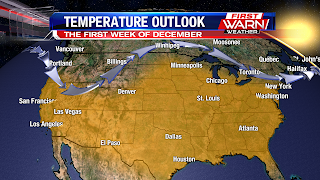 A strong low pressure system moving into the northern Plains and Upper Midwest late Thursday and Friday will bring an unseasonably warm air mass into much of the Stateline. Winds will increase from the southwest during the afternoon and with very little moisture from the Gulf of Mexico, skies will most likely remain mostly sunny through much of Friday. The combination of sunny skies and strong southwest winds will push afternoon highs into the upper 50's, if not near 60 degrees, Friday! The average high temperature for Friday is only 43 degrees. 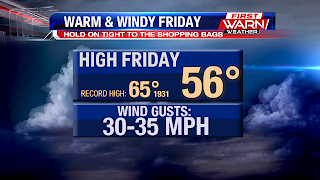 Wind gusts Friday afternoon will be around 30 mph from the southwest. 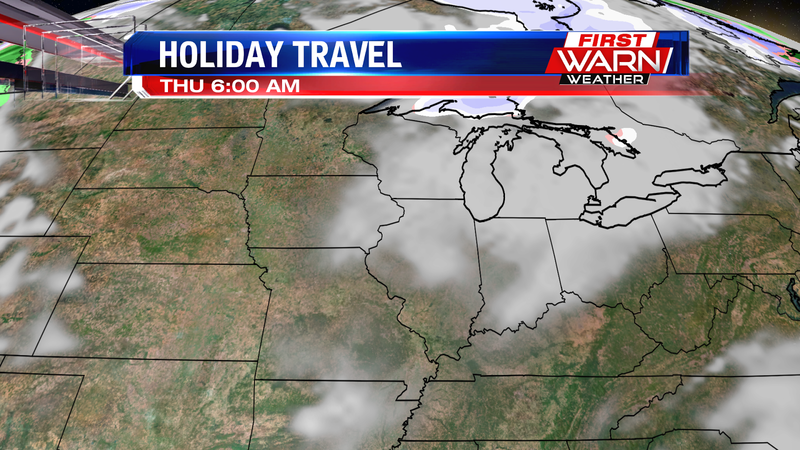 Heading out and traveling today? Overall the forecast across most of the country looks great! There are just a few things to keep in mind as you head out the door. No worries through the state of Illinois, Iowa, and Indiana. If you're heading north into Wisconsin late today or tonight, there will be light snow that develops ahead of a warm front. About a half an inch of snow is possible just north of the Dells. 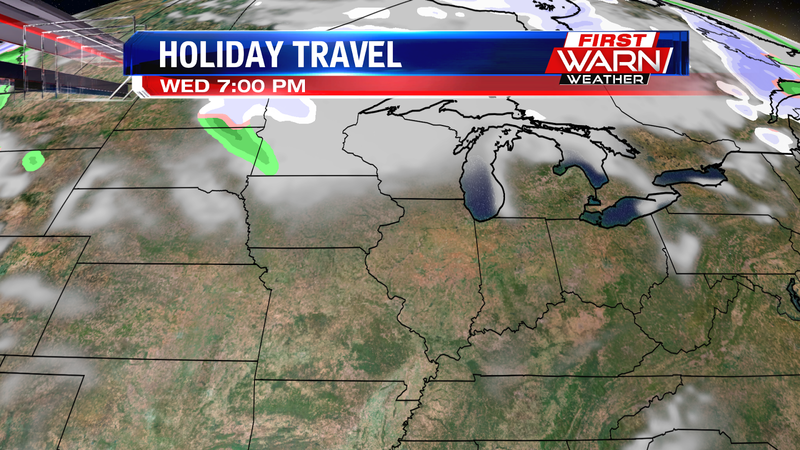 Snow will also be found northwest of that through northern Wisconsin, and through Minnesota. 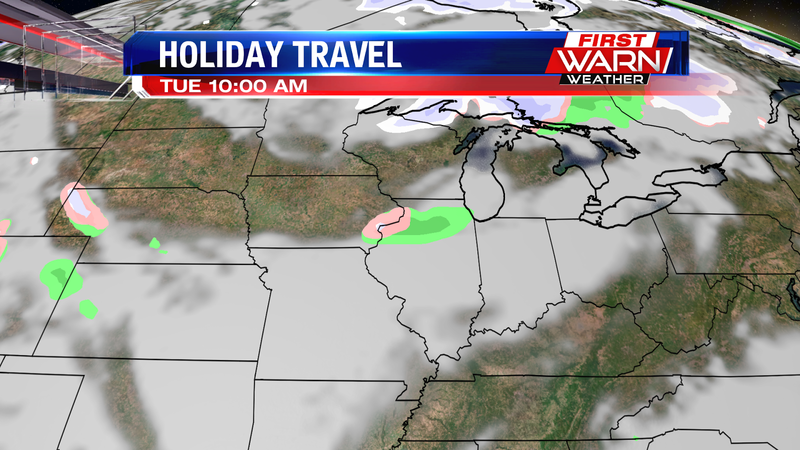 There is a small chance for flurries over northeast Iowa, but most of the snow probabilities will stay north of 94. Through the afternoon today, light lake effect snow will be noticed through northern Michigan and right along the lake shore. 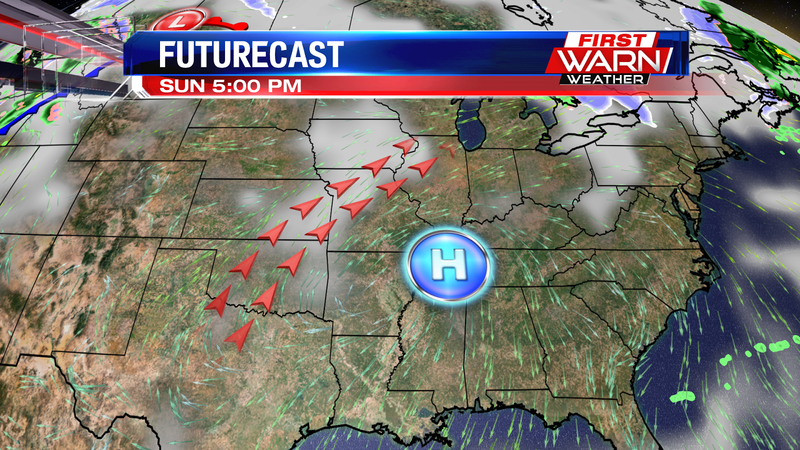 Otherwise, high pressure moving in today will keep sunshine in the forecast across Illinois, Indiana, and Iowa. 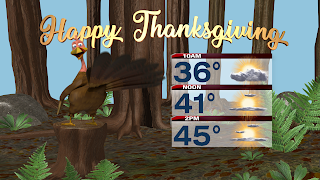 The forecast looks pretty quiet the next several days, including Thanksgiving Day. 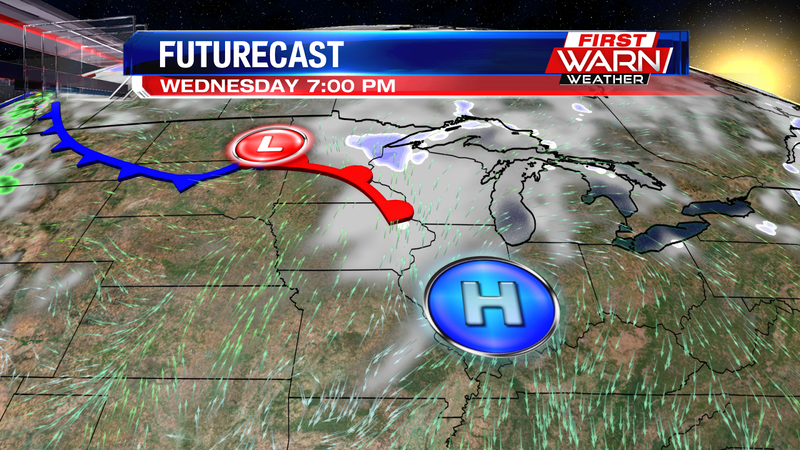 High pressure moves overhead Wednesday keeping most of the Midwest dry, but temperatures below average. 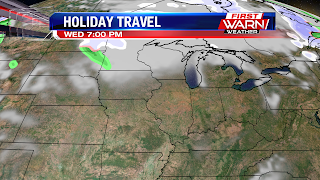 A fast moving clipper system does move through Minnesota and Wisconsin Wednesday and early Thursday, but shouldn't have too much of an impact on our weather locally for Thanksgiving Day. 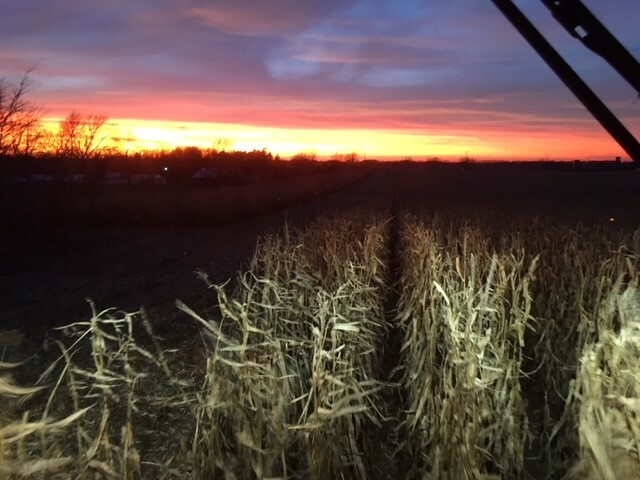 As a cold front skirts through southern Wisconsin late Wednesday night, it's possible there could be a passing shower or two. But our atmosphere will remain very dry and this may limit any precipitation from making it to the ground. 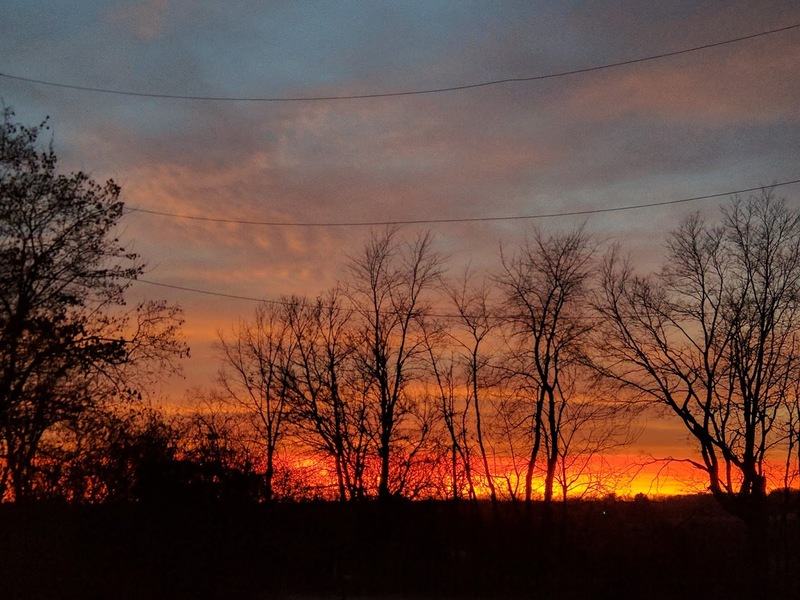 The high temperature of 47 degrees Tuesday was reached a little after 1 AM. Since then, the numbers have been falling as colder air spills south. Overnight lows Tuesday will drop into the low 20's, with a few spots even down into the upper teens. 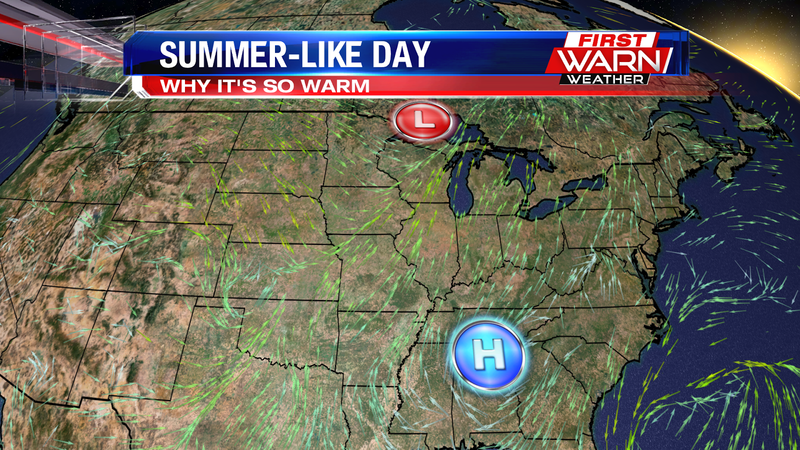 This a result of high pressure moving through the Stateline. Temperatures through the holiday weekend will be more like a roller coaster ride as numbers fall back into the 30's for Wednesday, and then into the 50's for Friday, only to drop back down into the 30's for Sunday. A series of storm systems will pass through the northern Plains and Upper Midwest this week. Each one will draw in a little warmth with it, but also pull down cooler air as it passes, leading to the rise and fall of highs this week. With the majority of Gulf moisture blocked this week the chance for rain will remain minimal. 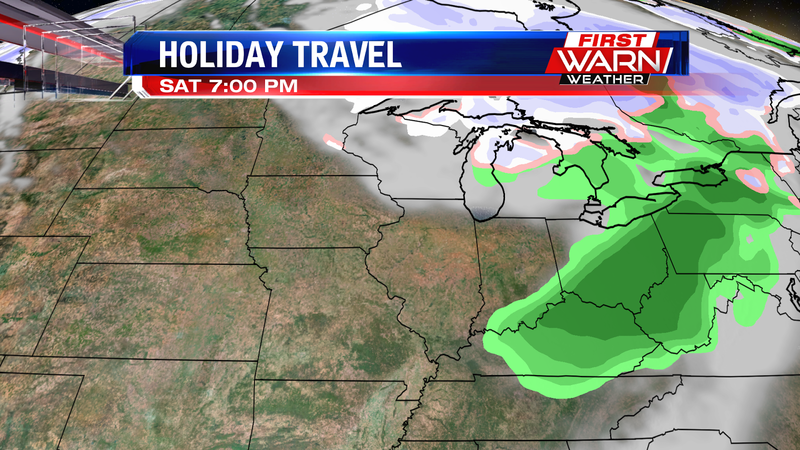 It looks like Friday evening/night we may get a few passing showers with the arrival of a cold front. After that the weekend is looking dry. A strong cold front will move through early Tuesday morning, bringing with it a much cooler air mass. Highs on Tuesday will most likely be reached after midnight, with temperatures expected to fall through the morning and into the afternoon. Winds will also increase Tuesday, gusting from the northwest around 30 mph. Wind chill values by Tuesday afternoon will be down into the low 20's. Clouds are already increasing ahead of the cold front so look for a mostly cloudy start Tuesday morning. While our atmosphere will be fairly dry, there could be enough energy in the atmosphere as the front passes to produce a few light flurries, or even a couple sprinkles mid to late morning. 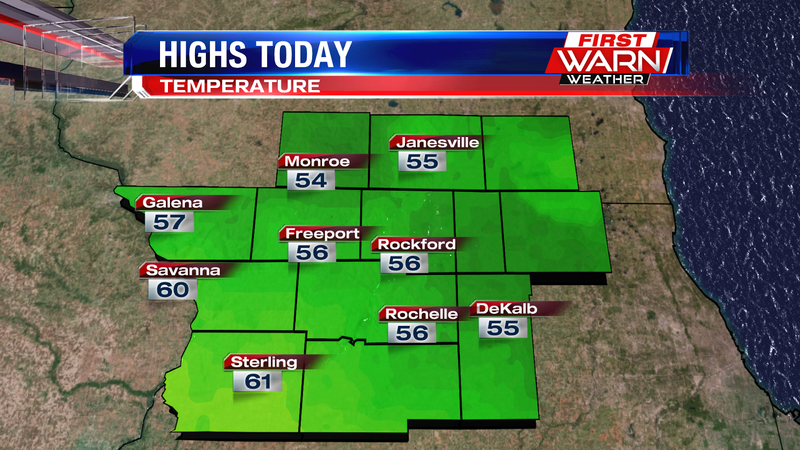 High temperatures Monday afternoon warmed to 55 degrees in Rockford, the warmest since October 26th. This time of year warm temperatures and gusty winds go hand and hand. In order for highs to warm well above average, there needs to be a strong wind to bring that warmth this far north. 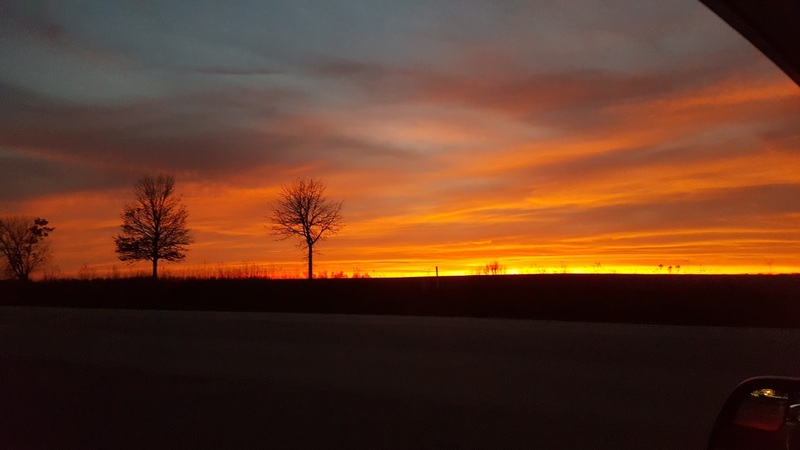 High pressure that was settled over the Midwest Sunday moved into the southeast, while low pressure moved through the High Plains and Upper Midwest Monday afternoon. Wind is caused by a difference in pressure between high and low pressure. Usually the bigger the difference is between the two, the stronger the wind will be. 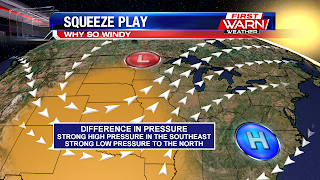 Wind around low pressure flows counter-clockwise and wind around high pressure flows clockwise. 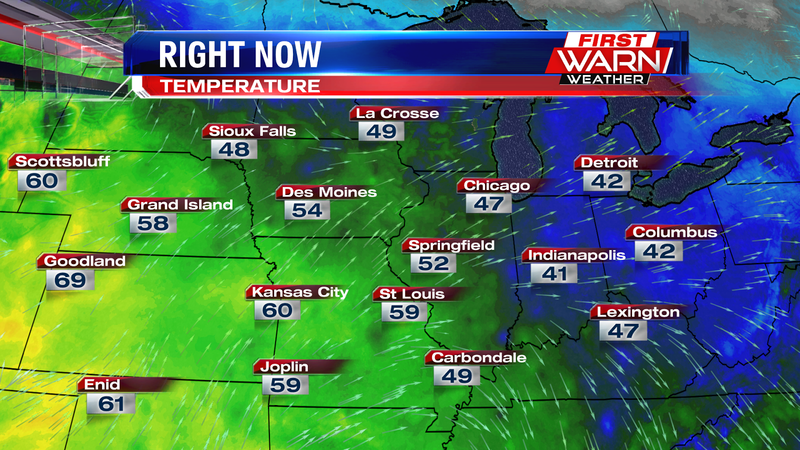 This placed most of the Midwest and Great Lakes within the warm southerly flow Monday afternoon. Both systems will move to the east, allowing a cold front to pass early Tuesday morning. 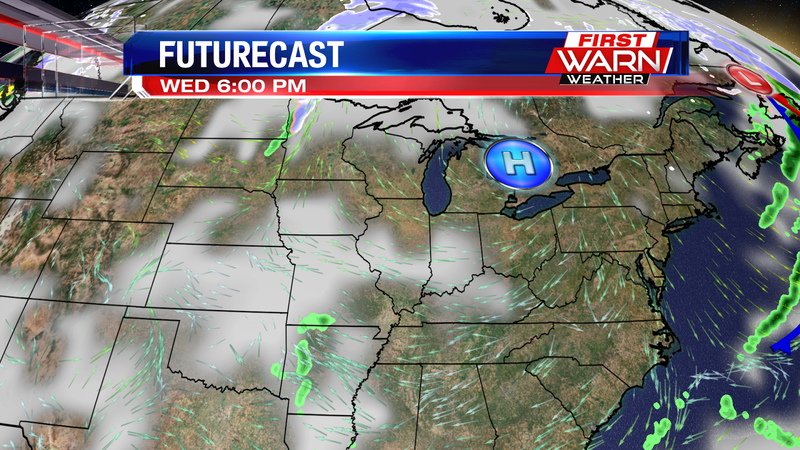 High pressure will then move in from the north (Canada) Tuesday afternoon. Winds will increase once again, but this time from the north. 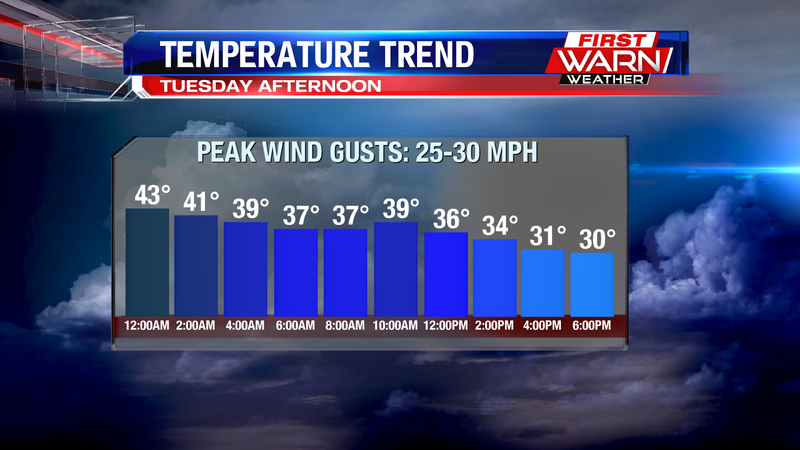 This will push afternoon temperatures down into the 30's with wind chills down into the low 20's. The countdown has started for the holiday season with Thanksgiving less than one week away. If you're planning a trip over the hills and through the woods, the weather shouldn't cause you many delays this holiday week. Gusty southwest winds Monday will bring temperatures over southern Wisconsin and northern Illinois into the mid and upper 40's, with a few spot tagging near 50 degrees. Winds will be gusting close to 25 mph, so watch out on those east/west roads. Low pressure passing to the north over the Upper Midwest and Great Lakes will pull a cold front through much of Wisconsin by Monday night, and then into northern Illinois by Tuesday morning. Moisture associated with the front will be limited, but there could be enough that gets wrung out to produce a light shower or two Tuesday morning. If anything, we may just end up with a little more cloud cover during the first half of the day Tuesday. Notice how Futurecast is bringing a small shower chance along the front as it passes mid-morning Tuesday. Following the front will be a much cooler air mass and gusty northwest winds. 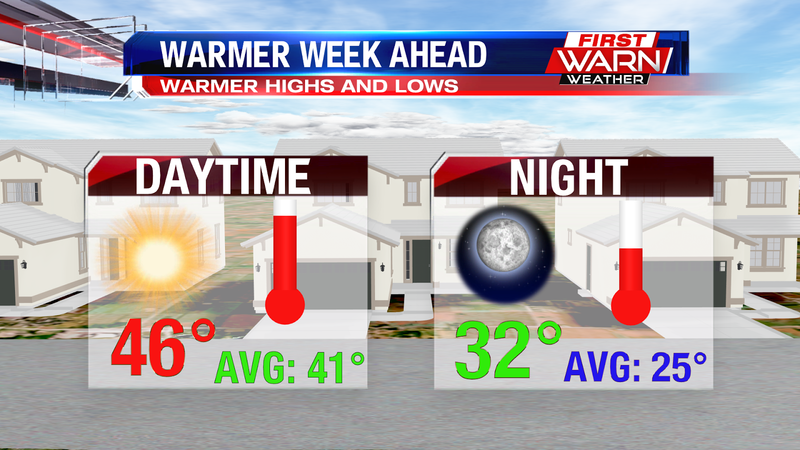 Temperatures will most likely fall through the 30's by Tuesday evening, and then down into the 20's by Tuesday night. 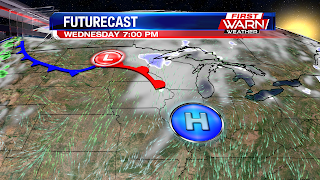 High pressure settles in locally Wednesday while a fast moving clipper system quickly moves into the High Plains Wednesday. Temperatures on Wednesday will be chilly, with highs only expected to warm into the low 30's. This will be over ten degrees below normal. While our skies will remain dry Wednesday, if you're planning a trip to the northwest to the Dakotas or perhaps northwest Minnesota, plan for a little snow or rain/snow mix - depending on temperatures - during the day Wednesday. 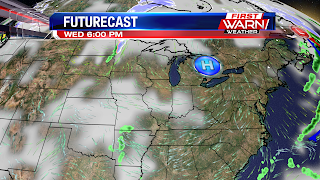 Cloud cover from that system will spread southeast Wednesday evening and night causing our skies to turn mostly cloudy as warmer air begins to spread eastward into the Great Lakes. The forecast right now looks dry, but with the arriving warm front we may have to add in a small chance for a few flurries or light mix either late Wednesday or very early Thursday. At this point, any impact from that looks minimal so we'll keep the forecast dry. By Thanksgiving, the day will most likely start off with a few clouds (from the passing system to the north). Temperatures will be below normal, but it doesn't look overly cold. 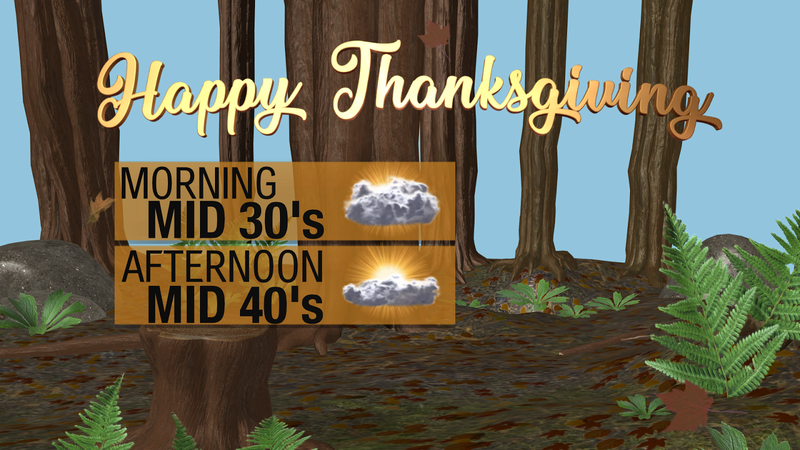 Highs will warm right around 40 degrees under partly sunny skies. 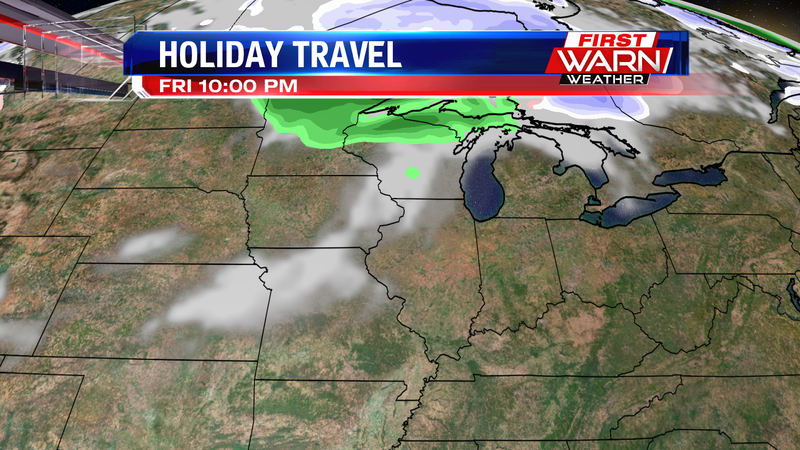 A stronger system then develops to the northwest by Friday, drawing in a little more warm air for Black Friday shoppers. Rain showers will be most likely for states like eastern Montana (snow near the Mountains), North Dakota and Minnesota during the afternoon and evening, with most of central and northern Minnesota, Wisconsin, and possibly southern Wisconsin and northern Illinois (depending on how far south the moisture will reach) Friday night into Saturday. Rain showers will also be falling over much of Michigan overnight Friday and into Saturday, and then for Indiana and Ohio by Saturday afternoon. As colder air arrives following the cold front Saturday, some of those showers over the eastern Great Lakes may turn to lake effect snow showers for Saturday evening and night. The strong low pressure will move into eastern Canada taking the core of the cold with it. There could still be a few spotty lake effect snow showers leftover for parts of the eastern Great Lakes. High pressure then moves in from the west Sunday and Sunday night leaving much of the middle of the country dry, but cool. 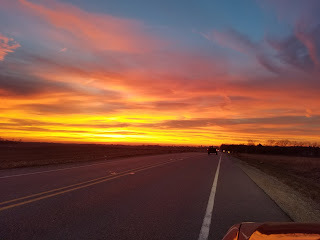 I hope everyone has a wonderful holiday week and safe travels to wherever you're headed for Thanksgiving! Nearing Record Cold Later this Week?